Our Pet Retreat Homes are specifically designed to accent your home décor and be a safe haven for your precious angel. 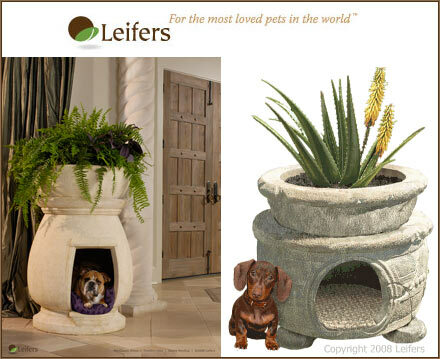 Leifers — For the most loved pets in the world. Our mission is to delight and inspire pets, their “pet-arents” and all those who serve the luxury pet industry.The idea began in 2006 when the owners, Kathy Ellis and Karl Krieg, needed a housing solution for starving kittens they rescued from their office complex. Over the course of the following months, the design kept evolving into what is now the Neoclassic and Old Ruins pet home retreats. The company intends to have several dog and cat house designs along with a line of all natural health and wellness products. The Old Ruins has that old world look and feel. Intricate in detail with a rich heritage this model is slightly smaller than the Neoclassic. Leifers pet retreat homes are made in a deeply textured, highly rigid plastic, using a roto-molding process. The plastic is thick, over a quarter inch, but its designed so no edge shows. This makes it appear as if the walls are 1.25” or thicker. It’s a challenge to make this way, to get the stone-like texture and hide the irrigation tube in the wall of the chamber. But it really looks substantial and no one will know it’s not stone or pottery. They are hand painted inside and out using UV resistant, lead-free, no- or low-VOC paints so they are completely pet safe. The paint has a stone-like grit to it, so the end result is an authentic pottery or stone texture and color.We suggest natural fertilizers for your plant, simply because they’re near your pet. Bowls for both models are removable so that the looks can be changed up with alternative tops. Peace of mind — these dog and cat houses are one of those gifts from the universe where all things lined up easily and effortlessly to make this creation possible. So do know that your precious little darling will be surrounded by great energy. Note: Plants must be purchased on your own, they do not come with the pet retreat. We encourage you to grow a live plant in the plant bowl, it will eventually offset any carbon paw print created in the manufacturing so you'll be an eco-friendly partner to the environment! FREE with Option Two - In addition to the Plant Bowl, we'll also include the Tabletop accessory so that you can change the look by setting the plant bowl and saucer to the side, and attaching the Tabletop. President Of United Kennel Club Says Pet Retreat Homes Pass The Test! It's beautiful. Everyone, even the non-doggy employees thought it was eye appealing and a great concept. The current dimensions would be suitable for dogs under 30 pounds only, somewhere around Beagle and Cocker Spaniel size, and under. The interior height is, therefore disproportionately tall, not in design terms but in dog terms. It doesn't mean a Beagle size dog would be annoyed or hindered by the extra ceiling height, but if you needed to cut down the interior height for weight or balance, there is plenty of room to do so. Overall, it is a very unique and elegant piece for a sort of boutique upscale market and you should have a lot of fun with it. Very refreshing design! I love it! Order Your Pet Retreat Home Today! The Leifer pet home retreats are not available in stores and can only be ordered through our website or by calling our office at 877-892-1328, order today!